A new pavilion for stargazers to enjoy the darkest night skies in England has been unveiled in a Northumberland village (Wednesday, July 9 2014). 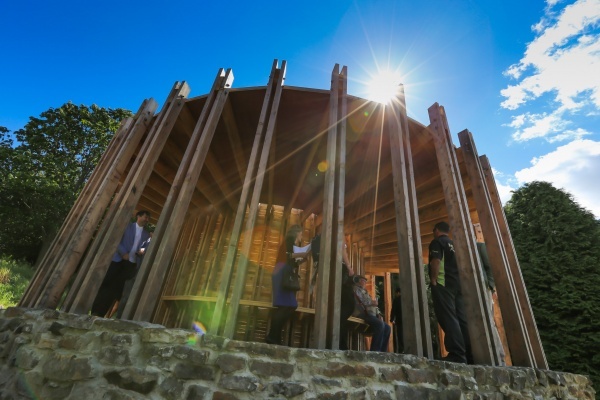 The Stargazing Pavilion at Stonehaugh, near Wark and in Kielder Water & Forest Park, was designed and built by students at Newcastle University’s School of Architecture, who worked closely with Kielder Water & Forest Park Development Trust and local residents on its development. The structure, which celebrates the recent Gold-Tier International Dark Sky Park designation, awarded to an area covering Kielder Water & Forest Park and Northumberland National Park, will be a focal point to the community, attracting amateur astronomers, hosting events and encouraging more tourism to the area. Lynn Turner, Director of Kielder Water & Forest Park Development Trust, said: “This project has been a great example of partnership working between the Trust and the University, with the community and the students working together to deliver a unique venue to view the stars. The project began in June 2013 where the 15 MA Architecture students held multiple consultation days to work closely with local residents and engage them in the design and construction process. Chair of Wark Parish Council and local resident, Anne Hutchinson, said: “The project was met with a lot of enthusiasm by the villagers and they’ve come along to whatever we’re doing with interest and a lot of knowledge. The Northumberland National Park Authority has contributed to the establishment of the wildflower meadow which is the setting for the circular pavilion, and has provided a grant for the planted green roof. Constructed with local timber and stone donated by the Forestry Commission, as well as providing a shelter for stargazers, the pavilion can also be used to watch wildlife. Plans are in place to designate the Stargazing Pavilion at Stonehaugh a Dark Sky Discovery Site along with a number of other sites which are being created throughout Northumberland International Dark Sky Park and the North Pennines Area of Outstanding Natural Beauty. Together with the world class Observatory at Kielder, these officially-recognised locations will offer visitors a network of opportunities to enjoy the region’s Dark Skies. The Stargazing Pavilion has also been supported by the Paul Hamlyn Foundation and Northumberland County Council Community Chest, and is part of the wider *Animating Dark Skies programme, which is supported by The Rural Development Programme for England, for which DEFRA is the Managing Authority, part financed by The European Agricultural Fund for Rural Development: Investing in rural areas. Northumberland County Council Community Chest, Northumberland National Park and the Rural Development Programme for England, for which Defra is the Managing Authority, part financed by The European Agricultural Fund for Rural Development: Europe investing in rural areas. The Animating Dark Skies programme is building on the growing interest in Northumberland’s dark skies and the development of astro-tourism. It will improve the quality of visitor experience, support businesses to take advantage of Dark Skies opportunities and create new accredited astro-event providers. The Animating Dark Skies project has been match funded by Northumberland County Council, Northumberland National Park Authority, Kielder Water & Forest Park Development Trust, the Forestry Commission, Northumbrian Water, Kielder Observatory, the North Pennines AONB Partnership, Newcastle University and Durham County Council together with support from Northumberland Tourism.